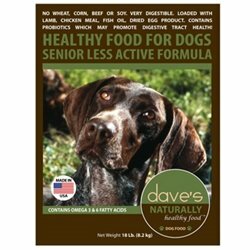 Dave's Naturally Healthy Senior Dog Dry Food is a healthy food for senior or less active dogs. The formula does not contain wheat, corn, beef, soy or fillers. 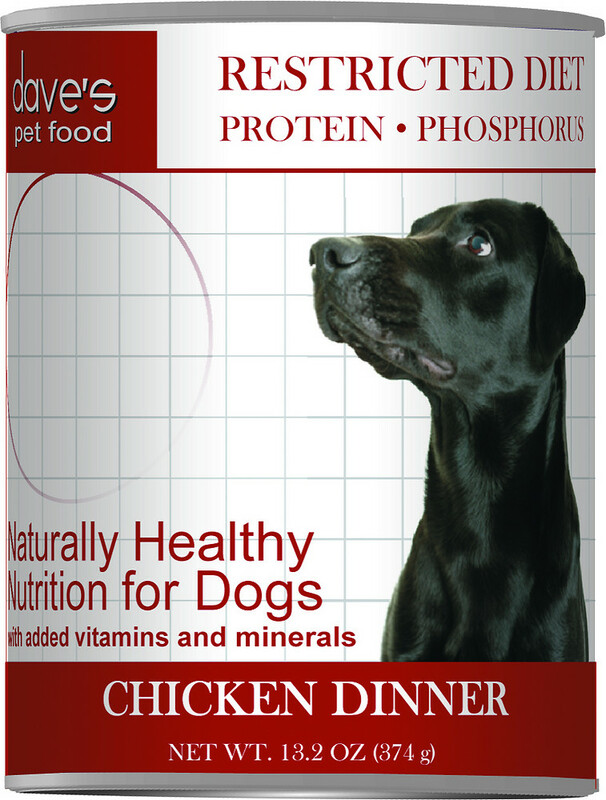 It is very digestible and it is loaded with lamb, chicken meal, fish oil, yogurt, dried eggs. Contains Probiotics which may promote digestive tract health. 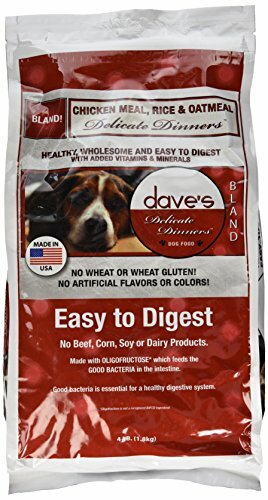 Great for dogs with allergies! Size: 18 pounds. 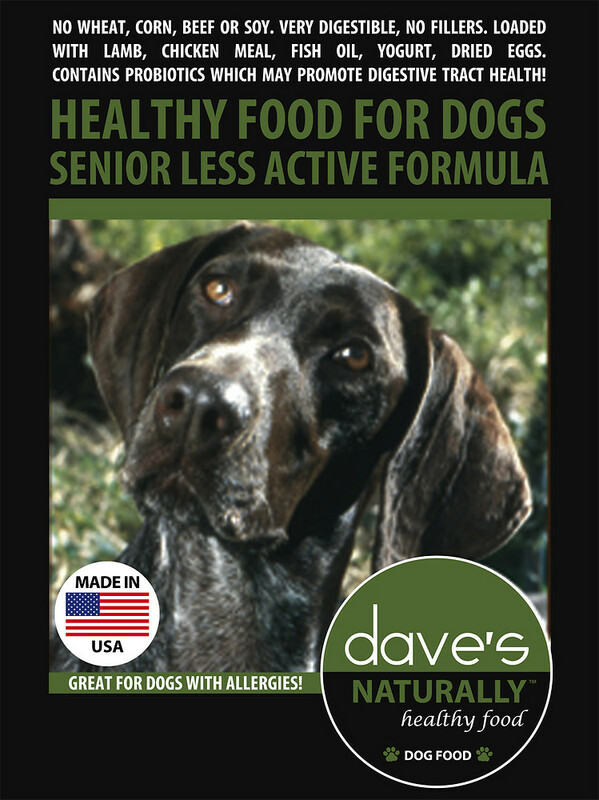 Dave's Naturally Healthy Adult Dog Food is an all natural food with added vitamins and minerals for all types of dogs. It is made with easily digestible lamb raised without artificial hormones and chicken meal. There are proper amounts of cheese, skim milk, peas and other nutrients that really make this food great. Dave's even added Menhaden fish meal which is a phenomenal source of digestible protein, and also provides Omega 6 and 3 Fatty Acids. This formula has no wheat, wheat gluten, corn, beef or soy. Size: 30 pounds. 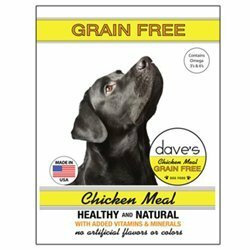 Dave's Pet Food Grain Free Chicken Meal Dry Dog food is 100% grain free and contains only high quality ingredients and added vitamins and minerals to make a complete and balanced meal! This formula is a tasty grain free formula with no grains, gluten, artificial colors or flavors, beef, corn or soy! there is added omega 3 and 6 fatty acids to help with skin and coat as well as joints. There are added pre and probiotics to help maintain a healthy digestive system. 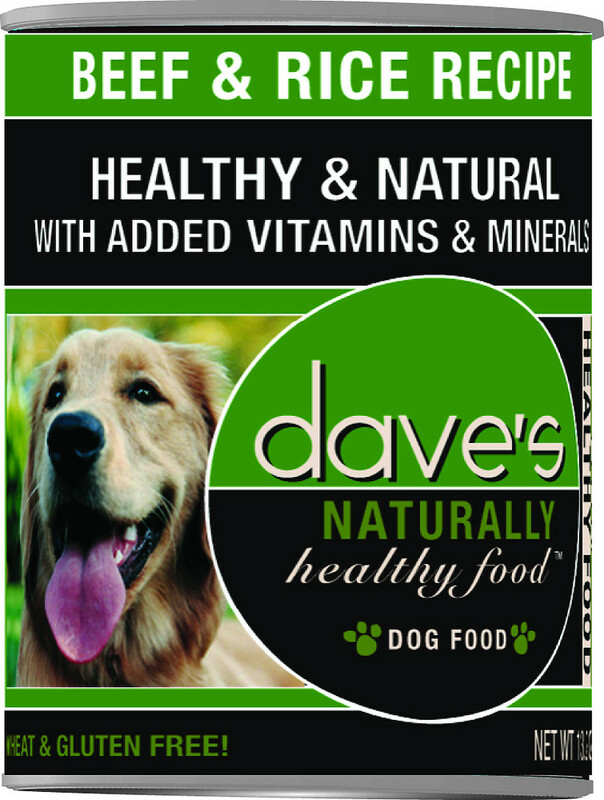 Dave's naturally healthy pet food is a simple, holistic formula. Chicken is the first ingredient, providing high quality protein. Added vitamins and minerals are essential for overall good health. It contains no wheat, gluten, corn or soy. Your best friend will love how great it tastes and you will love that it is made in the usa. 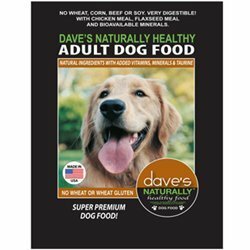 Features: for adult dogs healthy and all natural high in protein added vitamins and minerals contains no wheat, gluten, corn or soy made in the usa. Formulated to meet the nutritional levels established by the AAFCO dog food nutrient profiles. 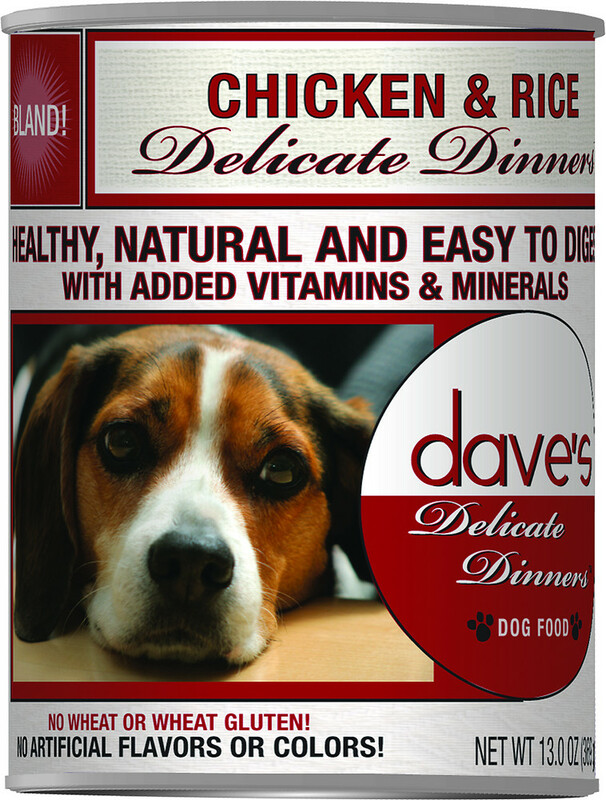 Dave'S Pet Food Chicken Rice And Oatmeal Bag, 30 Lb. 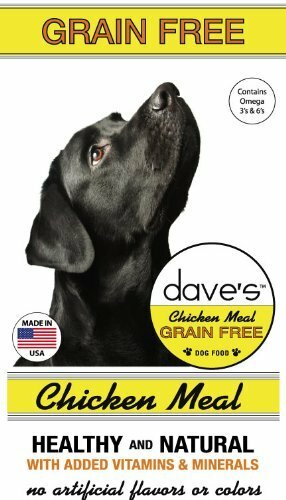 Dave'S Pet Food Chicken Rice And Oatmeal Food Bag, 4 Lb. 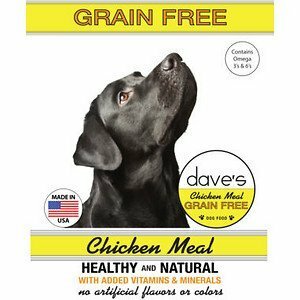 Dave's Pet Food, Grain Free Chicken Meal is a high quality, grain free dry dog food with added vitamins and minerals. 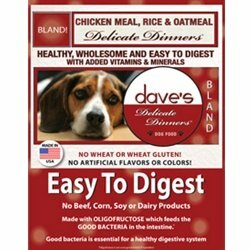 Healthy and natural, it is the perfect solution for dogs with allergies as it doesn't contain grains, gluten, artificial colors or flavors, beef, corn or soy. Made in USA. Size: 4 pounds. 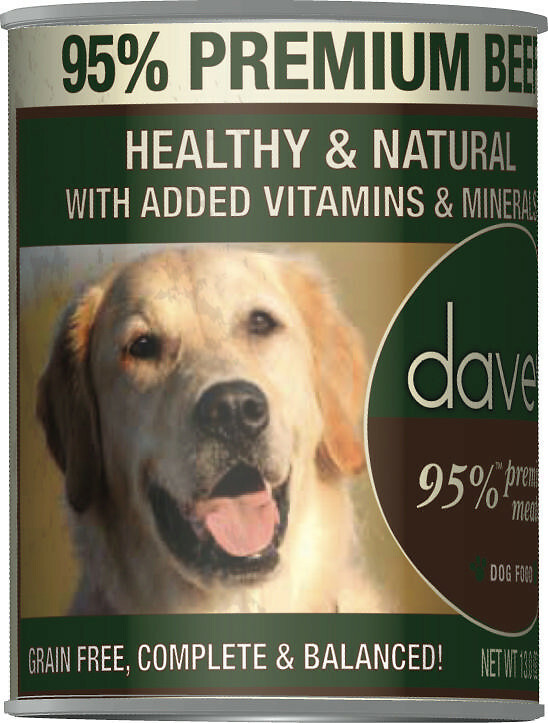 Dave's Naturally Healthy Adult Dog Food is an all natural food with added vitamins and minerals for all types of dogs. It is made with easily digestible lamb raised without artificial hormones and chicken meal. There are proper amounts of cheese, skim milk, peas and other nutrients that really make this food great. 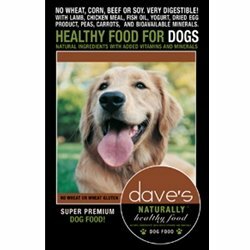 Dave's even added Menhaden fish meal which is a phenomenal source of digestible protein, and also provides Omega 6 and 3 Fatty Acids. This formula has no wheat, wheat gluten, corn, beef or soy. Size: 18 pounds. 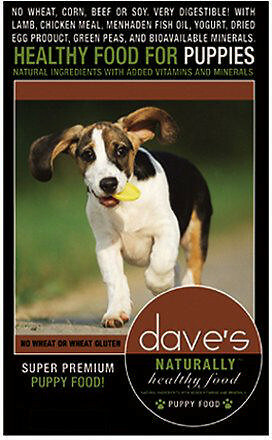 Dave's naturally healthy adult dog food is an all natural food with added vitamins and minerals for all types of dogs. It is made with easily digestible Lamb raised without artificial hormones and chicken meal. There are proper amounts of cheese, skim milk, peas and other nutrients that really make this food great. We even added menhaden fish meal which is a phenomenal source of digestible protein, and also provides Omega 6 and 3 fatty acids. This formula has no wheat, wheat gluten, corn, beef or soy. Size: 4 pounds. 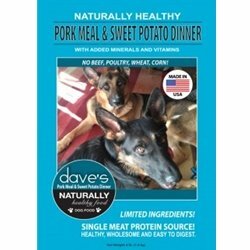 Dave's Naturally Healthy Pork Meal and Sweet Potato is a poultry free, dry dog formula with added vitamins and minerals. Healthy, wholesome and easy to digest, this food is made with a single protein source and it doesn't contain soy or dairy products. There are no ingredients that are known to cause allergy problems in dogs. 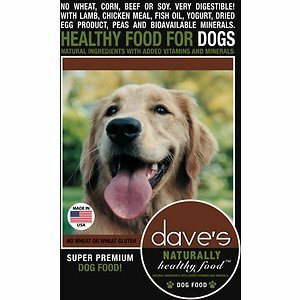 You should consider Dave's Naturally Healthy Pork Meal and Sweet Potato formula for your dog with food allergies. What makes this food different is not so much what is in it but what's NOT in it. It is a single protein source and it is truly a limited ingredient formula. This formula contains no poultry, no beef, no soy, no wheat, no gluten, no corn, no dairy products! Made in the USA. Size: 30 pounds. 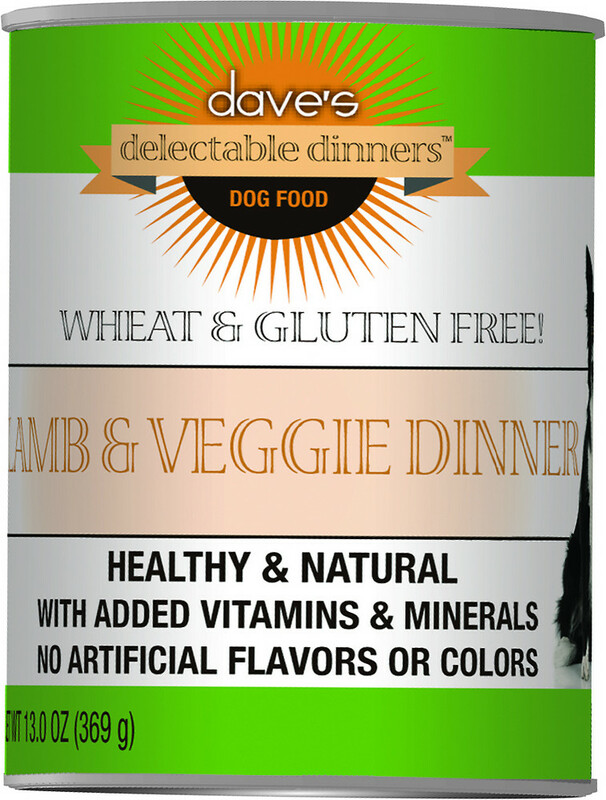 Dave's Naturally Healthy Pork Meal and Sweet Potato is a poultry free, dry dog formula with added vitamins and minerals. Healthy, wholesome and easy to digest, this food is made with a single protein source and it doesn't contain soy or dairy products. There are no ingredients that are known to cause allergy problems in dogs. 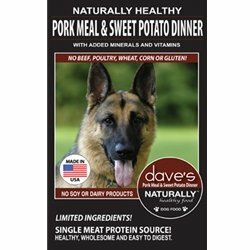 You should consider Dave's Naturally Healthy Pork Meal and Sweet Potato formula for your dog with food allergies. What makes this food different is not so much what is in it but what's NOT in it. It is a single protein source and it is truly a limited ingredient formula. This formula contains no poultry, no beef, no soy, no wheat, no gluten, no corn, no dairy products! Made in the USA. Size: 18 pounds. 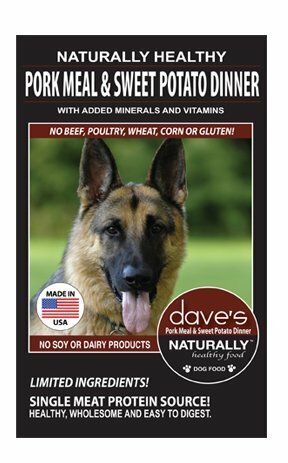 Dave's Naturally Healthy Pork Meal and Sweet Potato is a poultry free, dry dog formula with added vitamins and minerals. Healthy, wholesome and easy to digest, this food is made with a single protein source and it doesn't contain soy or dairy products. There are no ingredients that are known to cause allergy problems in dogs. 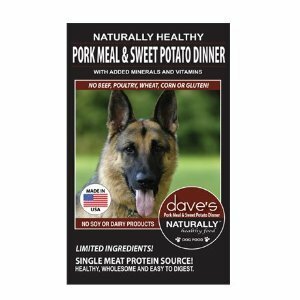 You should consider Dave's Naturally Healthy Pork Meal and Sweet Potato formula for your dog with food allergies. What makes this food different is not so much what is in it but what's NOT in it. It is a single protein source and it is truly a limited ingredient formula. This formula contains no poultry, no beef, no soy, no wheat, no gluten, no corn, no dairy products! Made in the USA. Size: 4 pounds. 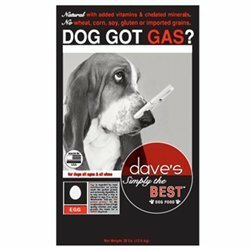 Dave'S Pet Food Dave'S Simply The Best Dog Food Bag, 16 Lb. 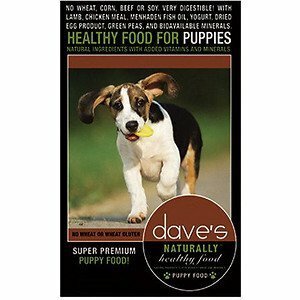 Dave's Naturally Healthy Puppy is all natural with added vitamins, minerals and higher protein levels to aid your puppy in growth and high energy demands. Hormone-free-de-boned lamb meat, yogurt (with probiotics), farmer's cheese, and skim milk that will help develop a healthy, young digestive track, and help build strong bones, muscles, and teeth. Added Menhaden fish meal which is a phenomenal source of digestible protein, and provides Omega 6 and 3 Fatty Acids. This formula has no wheat, wheat gluten, corn, beef or soy. Size: 4 pounds. 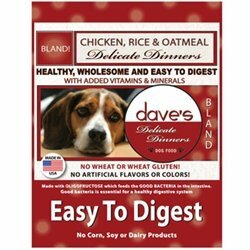 Dave's Pet Food Delicate Dinner Easy to Digest Chicken Meal, Rice and Oatmeal Dry Dog Food is specifically designed for dogs with sensitive stomachs who do better on bland diets. This formula has all the appropriate levels of fiber and other vitamins and minerals to ensure your dog receives all the necessary nutrients without upsetting their stomachs. Probiotics are added to help with digestion. There is no wheat, wheat gluten, artificial flavors or colors, beef, corn, soy or dairy products.